Created by the order of President Abraham Lincoln in 1861, Dakota Territory was formed by all or part of what is today the states of North and South Dakota, Montana and the northern half of Wyoming. According to US Census reports, the population of Morton County was 198 males and 2 females. On April 1, the first white child boy was born within the new city of Mandan, Thomas G. Conroy, Jr. Conroy’s father, Thomas, Sr. was a blacksmith at Ft. Lincoln at the time of General Custer’s ill-fated trip to Montana in 1876 and later moved to Mandan to establish a blacksmith shop in a log building just north of the former First National Bank buidling on west Main St. The Mandan Pioneer weekly newspaper began operation on October 1. Initially it was owned by F.H. Ertel, previously from Jamestown, and Herbert H. Gove originally from Rochester, Minnesota. Gove would quickly sell his interest in the venture. By 1909, it went into more homes in Morton County than all other publications combined. In January 1882, The Mandan Pioneer replaced The Mandan Criterion, as the official newspaper of Morton County. The Criterion was published by Harry Robinson who had immigrated from Wisconsin, and continued to operate until at least 1887. In March 1882, the first issue of the Mandan Daily Pioneer was offered. Mandan was the smallest city in the world to boast a daily newspaper. 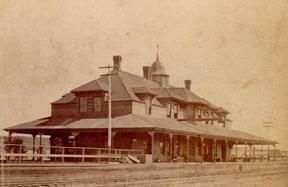 A new Queen Anne style passenger depot was completed in the Fall of 1882 at the cost of $12,000 ($270,000 in 2010 dollars). The 100-feet long by 32-feet wide building had a brick first floor and was surrounded by an 8-foot platform sheltered by a wood canopy supported by ornate iron pillers. The wood second floor was accented by hipped wall-dormers for the windows. The Western Union office located there would prove office for up to nine telegraph operators on duty 24-hours a day. A cupola with a bell-shaped roof topped the building. 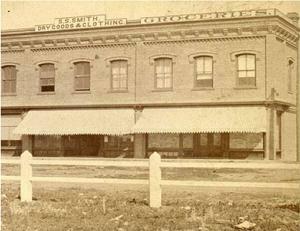 This building retained the title of the finest railroad depot west of St. Paul for over a decade. A special election was held in Mandan by the Morton County Commission to approve a $5000 expenditure ($130,000 2016$) to build an iron bridge south of the railyard across the Heart River. Not one dissenting vote. The 150-foot long bridge would open for traffic in 1882. Mandan experienced it's first major fire on November 29 along Main Street businesses. Mandan had no fire engine , but Mandan's superintendent telegraphed Bismarck's mayor for assistance. Within fifteen minutes, the Bismarck fire brigade was mobilized and hundreds of volunteers rushed to aid it's sister city. In thirty-five minutes, they had crossed the Missouri River by railcar and began dousing the fire with water from the rail car's engines. When the last flames were squelched, Mandan had lost three hotels including the Pacific Hotel and the Mandan House, Mack and Drury's restaurant, a hardware store, and a grocery house, totaling $17,000 ($430,000 2016$ dollars). Mandan's first volunteer fire department was formed in response to the event. Herman Yunck was one of the first members of the brigade. Estimated population of the city now numbered 1,500. Mandan claimed to have constructed more houses than any other in Dakota Territory. With the opening of the Heart River bridge, the US Army changed its supply contract to require delivery to Mandan instead of Bismarck. The loss of freight traffic from the east side of the river forced the steam ferries to lower their price, prompting more immigrants to arrive by water into Mandan. The murder of young Mrs. Julia (Laird) Kent in her home just south of the city monopolized the news. Although shot by the hired man, her husband Myron R. Kent (whose real name was William W. Pancoast) was the instigator of the crime. Out of town at the time of the incident, suspecision rose when he did not return for her funeral or his 10-year old son Earl. He was later apprehended in Colorado and brought back for trial. Found guilty, he was initially sentenced to be hanged at the Morton County Courthouse. A later trial resulted revised the sentences to life imprisonment for both him and the hired man. Mandan, now five years old, has a population of nearly 2500. Main Street businesses included ten saloons and boarding houses, six restaurants, four grocery/dry goods stores, three doctors, two pharmacies, a Chinese laundry, a tailor and dressmaker's shop, several livery stables, two banks, four churches, two schoolhouses, a lumberyard, a brickyard, an opera house, a flour mill, a train depot and freight house, a hotel, postoffice, courthouse and jail, a racetrack, two four-page weekly newspapers and an undertaker. In January 1886, County Treasurer Bingenheimer and County Auditor Van Vleck and Clerk of Court Doyle moved their records into the new courthouse and offices. The two story brick building was located on the hill west of Stark Avenue (which was later renamed Collins Avenue). 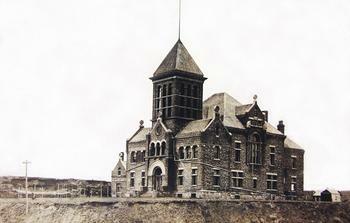 A sheriff's quarters and jailhouse, located to the west of the new courthouse, was also part of the complex. After extremely bitter winter temperatures, spring came to the area in late March. The Peoples and Shields stables experienced unusually high demand for buggy rentals for an impromptu Sunday drive, prompted by the mild weather. The work of washing buggies was a leading cottage industry in Mandan during the first part of the year. The city experienced one of the worst floods in its short history. The school was closed for two weeks in March-April due to the flood. Train traffic across the Missouri River was temporarily halted in April after the river ice breakup due to concerns over potential damage on the eastside trestle due to ice chunks. 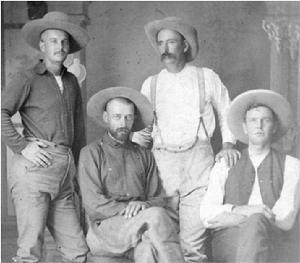 On June 13, Sylvane Ferris and 22 other men rode into town on their way to a round-up in the western part of the territory. They settled in at Curley Sublette's saloon, the popular resort for cowmen and old-timers. Fortunately the group "behaved very nicely while in town" according to newspaper reports. The population of Mandan stood at 2600. Mandan continued to expand as it supported Northern Pacific Railroad operations. In May, eighteen westbound freight trains operated through the city daily. In April a steam engine arrived to power the Mandan Pioneer newspapers presses. Chief Telegrapher Wood purchased a high wheel bicycle, one of the "kicking sort." In October, dry conditions contributed to wild prairie fires throughtout the region. The Mandan Pioneer reported, "Nearly all the land north and northwest of town for a distance of about 20 miles has been burnt over." In October, Theodore Roosevelt passed through the city by train, stopping by to say hello to his longtime friend Dr. Henry Waldo Coe. Roosevelt was returing from a hunting trip out west, where he claimed to have shot two grizzly bears. In November 2, North Dakota joined South Dakota as the 39th and 40th states to join the United States of America. No longer tied to Congressional imposed financial restrictions as a US territory, the City of Mandan opened the wallet and increased municipal debt limit beyond the prior 4% of value to fund the development of an artesion water well to supply the city.